Remove light to medium imperfections in one step! The P&S Deep Finish Restoration Polish will save you time and money by removing imperfections and creating a glossy finish in one step! Deep Finish will remove light to medium imperfections (swirls, fine scratches, oxidation, watermarks, etc.) in the paint while restoring a deep gloss. It is suitable for both OEM and aftermarket applications and it is low-dusting, making for an extremely easy clean-up. Pair this polish with a light cutting or finishing pad for best results. It does not contain any wax or silicones, making it safe for use in body shops. If you have heavier imperfections or need a lighter polish to refine the paint, check out the other P&S polishing options listed below. Take your paint to the next level with P&S Deep Finish Restoration Polish! P&S Envy Jeweling Polish - Light polishing and paint refining. P&S Deep Finish Restoration Polish - Great for removal of light to medium imperfections. P&S Ego Maker Compound - Safe and easy removal of heavy imperfections. Deep Finish is designed for use with high action, forced rotation or traditional rotary polishers. Deep Finish is a moderately aggressive leveling polish designed to produce incredible brilliance and depth in one paint correction step. Deep Finish is the ultimate product to rectify problematic paint finishes. Safe for use in body shops. Contains no wax or silicone. Select your desired tool and pad combination. 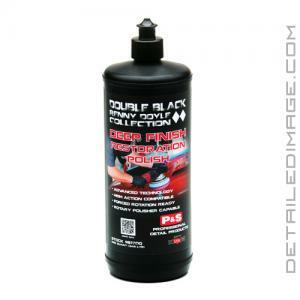 Apply a small amount of Deep Finish to the paint surface or pad and begin the paint correction process. Use light to medium pressure to produce bright finish. Work a 2' x 2' area or smaller and apply sufficient product to lubricate and provide sufficient cleaning. Take your time and repeat the process over entire paint surface. Inspect paint thoroughly to make sure all optimum results have been achieved.